The couple in the documentary showed on Saturday revealed the highlights of their relationship and wedding ceremony. 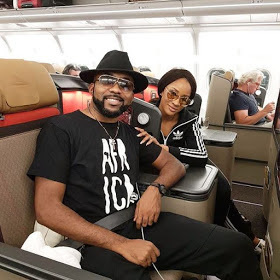 On Banky W’s part, he revealed that they had been in the relationship since 2015, adding that they started dating after he slid into Adesua’s Dm on Twitter. According to him, he never planned to date or marry anyone from the entertainment industry but got star struck after he realised Adesua was spiritually filled. He said, “I met Adesua in 2015 and after inquiring about her from her manager, Isioma, i went online to search for her and found her social media handles. "I wasn’t specifically looking for an entertainer as a wife because of what I presumed, but she took me off the balance. Banky in conclusion urged Nigerians to pray for them as that is all their relationship needs to be more prefect than the wedding.